Collingwood dates back to the 19th century as a vacation spot but I remember it in the 60s when we went there to ski Blue Mountain Collingwood Ontario. To me it is the best Ontario has to offer for skiing so that is where we went. 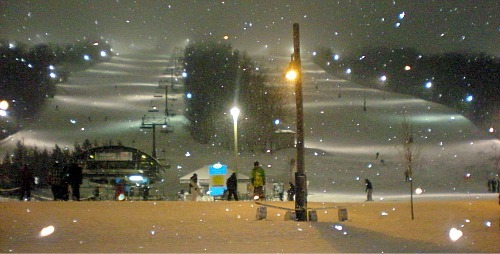 There are other ski clubs along the hill but most are private Craiglieth, Oslers Bluff and Devil's Glen to name a few. Collingwood has a harbour so was important for shipping and has a very viable town without the ski hill. Having said that the ski hill was a big draw for people in the winter and with Georgian Bay it has now become a year round play area! Boating swimming cycling hiking golf and so on!! Golf has taken off in Collingwood and has a list of 100 top courses so I would think there are more just not the top. Batteaux Creek, Blue Mountain, Monterra, Meaford, Osler Brook the list goes on. There is an Elvis Festival, all things Canadian in the fall around Thanksgiving. There is theater There are very good Restaurants ,Spas The Scenic Caves and the ski hill has a slide in the summer months. The downtown Collingwood has received a heritage designation from the Federal Government. There are amazing murals and of course a Museum. There is something for everyone and a large tourist development so no problem getting a place to stay. 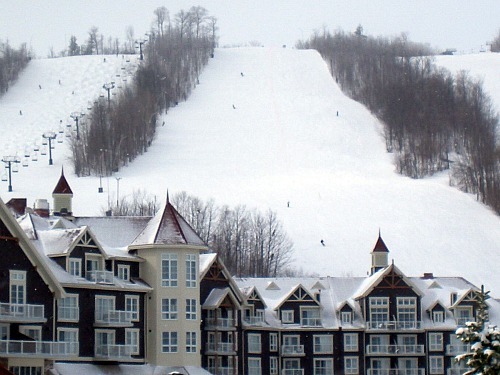 Intrawest has built restaurants, condos and hotels at the bottom of Blue Mountain and there are other venues as well like Cranberry Golf Resort. Collingwood is definitely worth a visit and has even become a booming retirement community among sports enthusiasts. Return HOME from Blue Mountain Collingwood Ontario.